“If we truly believed that eternal life with God is God’s gift to us already given it would put all our sufferings in perspective as temporary and transient. “Just a few days after Christmas, on 28th December, the Church remembers the Holy Innocents…. 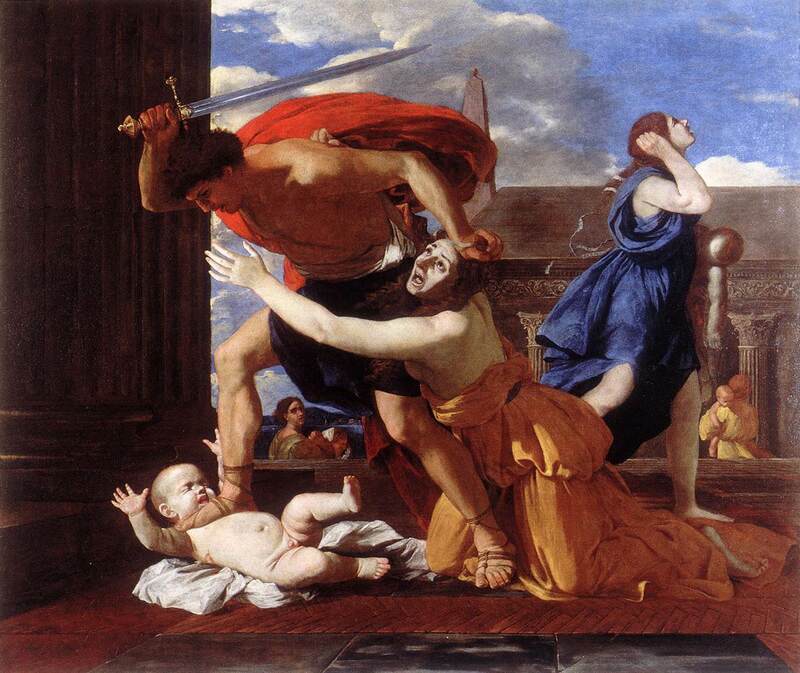 The babies whom Herod slaughtered were too young to be able to choose martyrdom, or, indeed, to refuse it. They were pure victims; and so were their mothers, agonising not only over the death of their children, but over their helplessness to protect them. This day is not a celebration but a commemoration, and it commemorates human cruelty and human vulnerability, the terrible ubiquity of suffering. (page 27)…. What the Church is determined that we should recognise is the inescapability of human suffering, and the need to come to terms with the full pain of it. Every parent who has lost a child, whether through sickness or accident, or human evil, has entered deeply into the experience that we commemorate as we remember the massacre of the innocents. They will have tasted the bitterness of their own inability to protect and save… bewilderment and even sense of betrayal…. That’s a line from Daniel Berrigan that rightly warns us that faith in Jesus and the resurrection won’t save us from humiliation, pain, and death in this life. Faith isn’t meant to do that. Jesus doesn’t grant special exemptions to his friends, no more than God granted special exemptions to Jesus. We see this everywhere in the Gospels, though most clearly in Jesus’ resurrection…. Jesus dies inside the humiliation and pain. God raises him up only after his death. …. It took the early Christians some time to grasp that Jesus doesn’t ordinarily give special exemptions to his friends, no more than God gave special exemptions to Jesus. “Christ is very close to all who suffer…. I come as a pilgrim of truth and hope to this Shrine of St Lazarus, as one who experiences in his own flesh the meaning and value which suffering can have when it is accepted by drawing near in trust to God who is “rich in mercy”. Dear brothers and sisters, in one form or another all human beings experience pain and suffering in their lives and this cannot but lead them to pose a question. Pain is a mystery, often inscrutable to reason. It forms part of the mystery of the human person…. This is the true meaning and value of suffering, of the pain which is physical, moral and spiritual. This is the Good News which I wish to pass on to you. To our human questioning, the Lord responds with a call, with a special vocation which is grounded in love. Christ comes to us not with explanations and reasons which might either anaesthetize or alienate us. Instead, he comes to us saying: “Come with me. Follow me on the way of the Cross. The Cross is suffering”. “Whoever wants to be a follower of mine, let him deny himself, take up his cross and follow me” (Lk 9:29). Jesus Christ has taken the lead on the way of the Cross. He has suffered first. He does not drive us towards suffering but shares it with us, wanting us to have life and to have it in abundance (cf. Jn 10:10). Suffering is transformed when we experience in ourselves the closeness and solidarity of the living God: “I know that my Redeemer lives, and at the last … I shall see God my Saviour” (Job 19:25-26). With this assurance comes inner peace, and from this a spiritual joy, quiet and deep, springing from the “Gospel of suffering” which understands the grandeur and dignity of human beings who suffer with a generous spirit and offer their pain “as a living sacrifice, holy and acceptable to God” (Rom 12:1). This is why those who suffer are no burden to others, but with their suffering contribute to the salvation of all. Suffering is not only physical. There is also suffering of the soul, such as we see in those who are isolated, persecuted, imprisoned for various offences or for reasons of conscience, for ideas which though dissident are nonetheless peaceful. …. Pain is a call to love, which means that it ought to engender solidarity, self-giving, generosity in those who suffer and in those called to accompany and aid them in their distress. The parable of the Good Samaritan (cf. Lk 10:29ff. ), which puts before us the Gospel of solidarity with our suffering neighbour, “has become one of the essential elements of moral culture and of universally human civilization” (Salvifici doloris, n. 29). In effect, Jesus in this parable teaches us that our neighbour is anyone we meet on our way who is wounded and in need of help. He must be helped in an appropriate way in the evil that has befallen him, and we must care for him until he is fully recovered. Families, schools and other educational institutions, even if only for humanitarian motives, need to work perseveringly to awaken and refine this sensitivity to the suffering neighbour, whom the Samaritan of the Gospel symbolizes. The eloquence of the parable of the Good Samaritan, as of the entire Gospel, is in real terms this: human beings must feel personally called to witness to love in the midst of suffering. “Institutions are very important, indeed indispensable; but no institution can of itself substitute for the human heart, human understanding, human love, human initiative, when it is a question of going to meet the suffering of another” (ibid., n. 29). This is true of physical suffering, but it is even more true of the many kinds of moral suffering, and when it is primarily the soul that is suffering. This is why when persons suffer in their soul, or when the soul of a nation suffers, the pain must be a summons to solidarity, to justice, to the building of a civilization of truth and love…. Beloved brothers and sisters, in the anguished moments of our personal, family or social life, the words of Jesus help us in our trials: “My Father, if it is possible, let this cup pass from me; yet not what I want but what you want” (Mt 26:39)…. No suffering is lost, no pain is without significance. God takes it all to himself, just as he accepted the sacrifice of his Son, our Lord Jesus Christ. “The God who accepted being crucified—Jesus on the cross—accepted crucifixion because he saw what would become of it. It would redeem the world because it would offer people a faith that would change their lives. But it is we who have to change our lives. God will never do it for us. He showed us that on the cross. He suffers with us. He suffers in us. He makes suffering bearable. “The disabled person, with all the limitations and suffering that scar him or her, forces us to question ourselves, with respect and wisdom, on the mystery of man. In fact, the more we move about in the dark and unknown areas of human reality, the better we understand that it is in the more difficult and disturbing situations that the dignity and grandeur of the human being emerges. “Any good psychologist, spiritual director, or mentor of soul, will tell you that, most often, real growth and maturity of soul are triggered by deep suffering and pain in our lives. It’s not so much that God doesn’t speak as clearly to us in our joys and successes, but we tend not to be listening in those moments. Suffering gets our attention. As C.S. Lewis once said, pain is God’s microphone to a deaf world. There is, undeniably, a connection between suffering and depth of soul. “Matthew portrays Jesus as the suffering servant who, even though he is in complete control of his situation, chooses to suffer out of obedience and out of love. Not only does Jesus suffer terrible physical pain, Matthew also depicts his final hours as a time when Jesus is utterly abandoned and humiliated…. In the course of his passion, Jesus confronts all manner of sin — betrayal, desertion, violence, lies, abuse of power, cruelty. And he takes away this sin precisely by his obedience and his love…. Why did God’s only Son have to meet such a terrible death? Why did Calvary take place? St John gives us the answer in one short sentence that sums up the whole of his Gospel: “For God so loved the world that he gave his only Son, that whoever believes in him should not die but have eternal life” (Jn 3:16). “We can try to limit suffering, to fight against it, but we cannot eliminate it. It is when we attempt to avoid suffering by withdrawing from anything that might involve hurt, when we try to spare ourselves the effort and pain of pursuing truth, love, and goodness, that we drift into a life of emptiness, in which there may be almost no pain, but the dark sensation of meaninglessness and abandonment is all the greater. 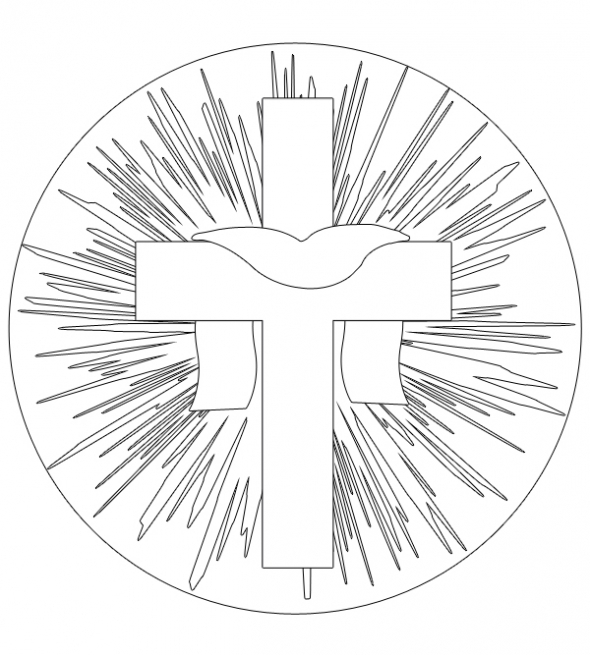 “Suffering and The Eucharist:…. If we truly believed that eternal life with God is God’s gift to us already given it would put all our sufferings in perspective as temporary and transient. Jesus saw suffering in this way. He saw that every aspect of his life, including pain, suffering and death, could glorify his Father, the giver of life, by being accepted and embraced. …. God can take away sin, the fundamental attitude of stubborn resistance to God, which is the cause of our deepest suffering… While the success of Christ’s redemptive activity is guaranteed by the Cross and Resurrection, it remains a work in progress, work which is entrusted to the Church, as the body of Christ. Because we are members of Christ’s body we share in that redemptive work and our sufferings can play a privileged part. By surrendering our sufferings as a gift to God we embrace redemption as our ultimate destiny and we witness to the redeemed state of the world. Our sacrifice becomes united with that of Christ, who, through his sufferings, ‘takes away the sins of the world’…. When we celebrate the Eucharist, we are united as much as is possible this side of eternity with Christ and one another. While the Eucharist cannot take away the pain of our sufferings, it transforms them from a sense of foreboding about death into the promise of eternal life…. “Here’s what Christians have come to believe about suffering. God does not need or want us to suffer; God wants us to have life and to live it to the full. We bring much suffering and evil into the world by the abuse of our freedom, but at the end of the day God created a world in which this is possible, and we must reckon with this when we speak of God as all-powerful and all-loving. A world in which people are free to love and therefore also to abuse their freedom, we believe, is better than a world in which no freedom exists. But human freedom comes with a huge price tag, often with the innocent suffering most. There is also suffering that cannot be accounted for by the abuse of human freedom. Ultimately, the existence of suffering and evil remain incomprehensible mysteries, and accepting this fact is connected with accepting that God is an incomprehensible mystery. The only answer we Christians have to the mystery of suffering is Jesus Christ. Through him we come to realise that suffering is not part of God’s plan for creation, and that the God is as repulsed by human suffering as we are. Jesus spent his life, and ultimately gave his life, to alleviate suffering, whether caused by sickness or by sinfulness. As his disciples, we are required to “touch the suffering flesh of Christ in others” and to heal it as best we can (The Joy of the Gospel, 24, 270). Faced, however, with unavoidable suffering, what can we do? Suffering is easier to deal with if our general attitude is one of accepting that our lives are in God’s caring hands, and, that anyway, we are finite and dependent creatures. Ultimately, our lives belong to God who cares passionately about us. If surrender to God generally characterises our attitude to life, then trusting God in times of suffering will be easier, as it was for Jesus. His daily prayer, which he taught us, was “thy will be done”, and this made it easier to pray in Gethsemane “Yet not what I will, but what you will” (Mk 14:33). We can also see our sufferings as a participation in Christ’s redemptive activity, which, although its success is guaranteed, remains a “work in progress”. All very well, but does this really help as we look in to the eyes of a suffering child, as Stephen Fry has challenged us to do, and still profess belief in a loving God? He continued: “Certain realities in life we only see through eyes that are cleansed through our tears.” Then he embraced Glyzelle. As Christians we cannot explain the reality of suffering; nor can we take it all away. We can ensure that our eyes are open to it and that our hearts and hands are ready to tackle it. In so doing we believe Christ is in us and we meet Christ in those we embrace and are held in the mystery of his love.